Almost two years ago I let go a volunteer project that I'd started, Open Coffee Almere. The project had out-grown me and in order to prosper needed someone else in charge. So I passed the project on and stepped back completely. 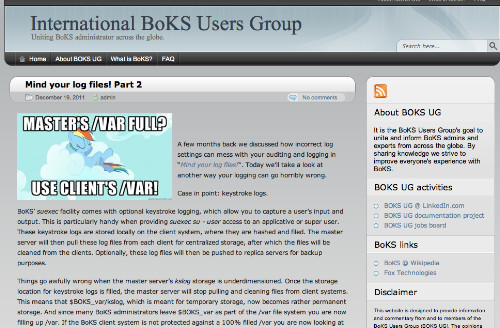 Another project that was started at roughly the same time, but which never really took off is the BoKS Users Group. Meant to unite FoxT BoKS administrators across the globe in order to share knowledge, it was mostly me trying to push, pull and shove a cart of rocks. A lot of people said it was a great idea and they'd love to join, or to provide input or to benefit from it. But none of that ever really happened. And then even I stopped pushing updates to the website. Hence why I've decided to pull all the content back into my own website and to shutter the site. I'll probably also give admin rights of the LinkedIn group to FoxT and that's that. Funny how those go sometimes. Lots of people are good starters but bad finishers :). Once the intitial freshness wears of only a few remain. What do you think prevented people from doing their part you think in this case? -sharing knowledge perhaps not a value of that many people? -too busy with other things/no focus? Kidding with the last one of course but I personally find that something can apply to what I'm doing right now, but then when it doesn't also a future goal it can be hard to stay motivated for something. Linking a group to a concrete future goal, not just sharing knowledge, might do the trick. Including myself. If I lose momentum then it's hard to keep going, especially if there's no apparent interest in the undertaking. Many things :) As you say, "just too busy with other stuff" is one part. And on the other hand I guess that sharing knowledge might not even be that valuable as there is a limited market for BoKS. And so far the company behind the software has always treated their customers as little islands. You make a great point about the future goals: for many people BoKS is only of short interest. They work with it during their current consulting gig, but they are also sure that they'll never see it again at another client. Hence, extensive knowledge might not be that valuable. Having a common, tangible goal would have been great, I agree.